We left Punta Arenas in the morning on day eleven by bus — the same Ushuaia-bound bus we encountered the day before at the bizarre stop by the side of the road. The passenger exchange occurred in the same shady manner. It was like some drug deal taking place on the outskirts of town. Today's bus trip was to be the longest of the whole tour. With ferry and border crossings, we were looking at a total of 10-12 hours of travel time. Nicole looked into alternate ways of getting to Ushuaia, but although both Punta Arenas and Ushuaia have international airports, interestingly enough, no airline offers flights between them, so bus or car is really the only option. The first stop was the ferry terminal, where we would cross the Strait of Magellan at its narrowest point, only about two miles across. Our timing was perfect. We arrived just as the ferry was unloading, which probably shaved an hour off the original ETA. It was impressive to see so many trucks, buses, and heavy machinery get off the ship. Once aboard, the ride only took about 20 minutes. Surprisingly, there was no sea traffic along the strait. Before the Panama canal opened in 1914, the Strait of Magellan was a major time saver for ships, but nearly a century later, it seems to have entirely lost its appeal. Crossing the border back into Argentina went a lot smoother than it did the other way. No bags were X-rayed (though Gem said they reserve the right to and sometimes do), which is good because on such a long bus ride, the contraband of oranges we had stashed came in handy, especially considering the bus made no more stops for the remainder of the trip. As we approached Ushuaia, it was interesting to see the landscape change from the semi-arid steppe to the more humid and foresty terrain of Tierra del Fuego (Spanish for Land of Fire). The native people of this chain of islands astonishingly walked around completely naked and somehow managed not to freeze to death by rubbing themselves with oil and keeping close to an open fire at all times. Yes, these people were bold, but they were also daring. When they paddled out in their canoes, they took fire with them. Think about it: fire. In wooden canoes! Upon sighting these fires on land and canoe back in the 16th century, Magellan apparently gave the area the name Tierra del Fuego. 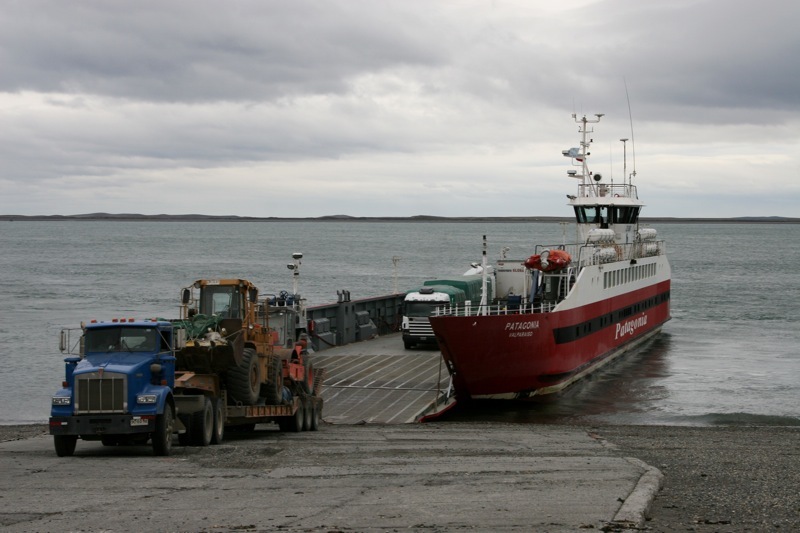 The ferry at the Strait of Magellan crossing can transport some serious tonnage. Against all odds, we arrived before 8pm, while the sun was still very high. 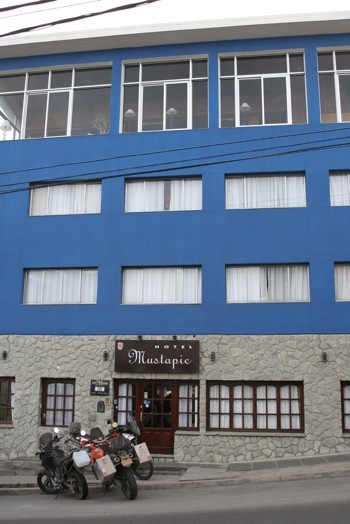 In Argentina, no one but a tourist will sit down at a restaurant for dinner before 9 or 10pm, and Ushuaia is no exception, but all that time spent on the bus left us hungry, so we went to dinner promptly after checking into the Hotel Mustapic. After dinner, the Irish party in our group went to chat up their compatriots at the local Irish pubs, while the rest of us crashed, exhausted. The next morning Gap had reserved for us a boat tour of the Beagle Channel that would take us even further south, as if 54°48′S wasn't south enough. At that latitude, Ushuaia is the southernmost city in the world and likes, nay, loves to call itself Fin del Mundo (End of the World). 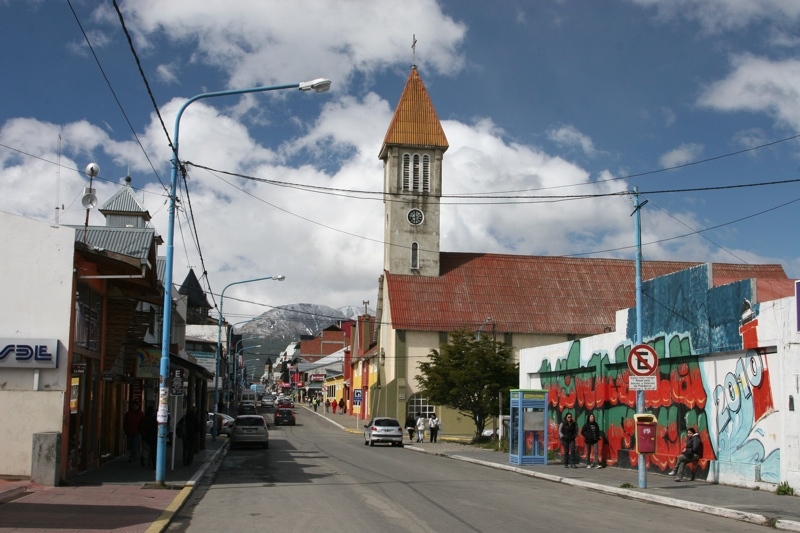 Of course, there's Chile's Puerto Williams that is further south (54°56′S), but it doesn't get the title on a technicality — it's not a city (population: only around 2,000). 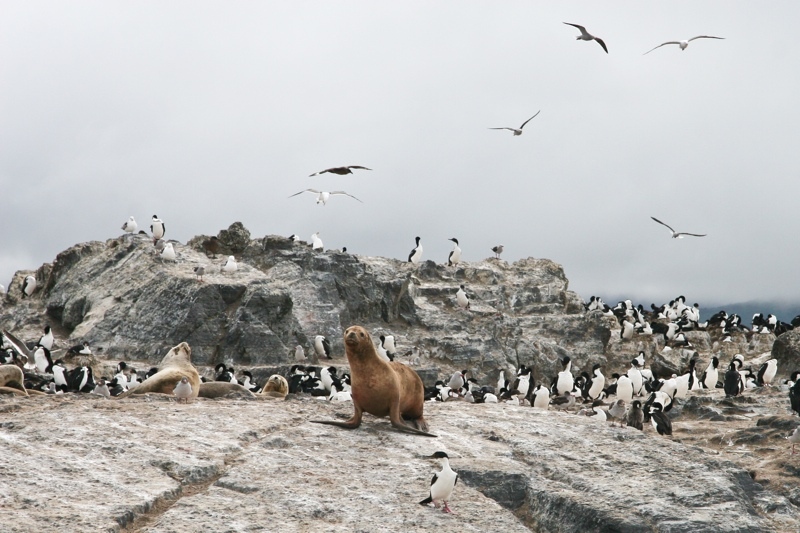 Not long after we sailed out of the harbor, we reached a tiny island in the channel that was just teaming with life. Hundreds of cormorants, sea lions, seals, and seagulls were battling for real estate and making a big racket about it. The captain I felt got us dangerously close to the rocks, but I am grateful for the almost personal encounter with the birds and mammals of this natural zoo. A few times I thought I saw cormorants dive into the water and come out with fish clutched in their beaks, but it wasn't fish — it was seaweed, which they use to build their nests tiny bit by tiny bit. 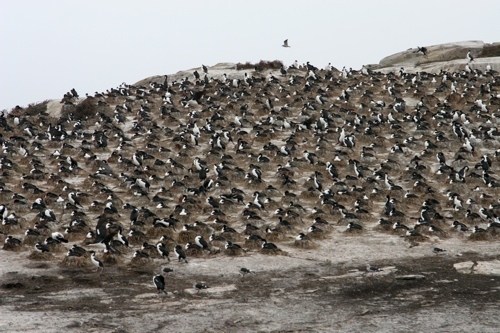 In the photo below, if you look carefully, you will see the individual nests the cormorants are sitting on, all made of seaweed. Some cities like Melbourne pride themselves with having all four seasons in a single day. Ushuaia can have all four in 20 minutes. When the boat tour started, it was perfectly sunny. By the time we reached the second cormorant island, it was pouring. And when we returned to land, it started snowing. The only advantage Ushuaia has going for it weather-wise, as far as I'm concerned, is that it isn't terribly windy, something we found delightfully refreshing after ten days in windswept Patagonia. 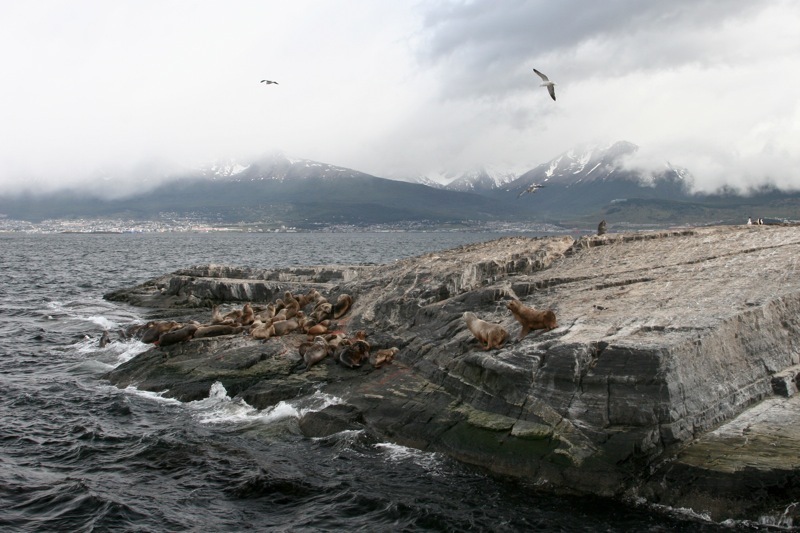 The overpopulated sea lion and cormorant island has a good view of Ushuaia. The four seasons took a toll on my health, however, and by the end of the day, the cold I thought I had put behind me days ago had returned, badder than ever. I ended up spending more time than seemingly possible in the miserable Hotel Mustapic, which was no Four Seasons. 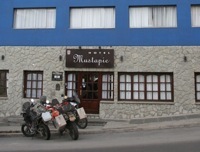 Owned by an elderly Croatian lady whose daughters run the establishment and speak not a word of Croatian nor English, the hotel is bitterly cold, drab, and poorly run. The lobby is locked and unmanned at all times, which means to get in, guests must ring the outside door bell, which echoes across all floors, and wait for one of the daughters to traipse down the stairs from the solarium on the third floor (their permanent hangout), and open the front door. If you have a choice in accommodations, look elsewhere. The few times I felt well enough to walk outside, I did some souvenir shopping. Souvenir stores in Ushuaia had Fin del Mundo mania. Countless shirts sold were labeled with the likes of “if you look to the north, all that will be behind you, will be your back.” Puerto Williams gets no recognition, of course. On this excursion you get shaken up inside a 4x4 vehicle. However, Lakes Offroad is a trip for all ages. That doesn't mean we won't be driving into the lake itself to surf the waves, or taking on impossible mud tracks, or rescuing the truck ourselves from natural ensnarement using the winch. You can't miss this trip! Unsurprisingly, no one wanted to go offroading and get stuck on purpose. However, most of the ladies in our group, did go on the canoe ride, which nearly ended in disaster. No, they weren't trying to imitate the Yaghan people and start a fire in their canoe. One of the canoes, the one the so-called guide was commanding, flipped over and submerged its occupants in the frigid water. Fortunately, they had a change of clothes with them, but I didn't envy Jocelyne for the experience. On day fourteen it was time to say goodbye to Gem, our terrific guide in this wonderful wilderness, and return back to civilization. We had one more day to spend back in Buenos Aires before flying home, on which Nicole and I had scheduled a bike tour of the city. I still wasn't feeling well though, and after recalling what Augustina had said about biking in Buenos Aires, namely that it is something of an extreme sport, we instead spent the remainder of our free time finishing up our souvenir shopping. 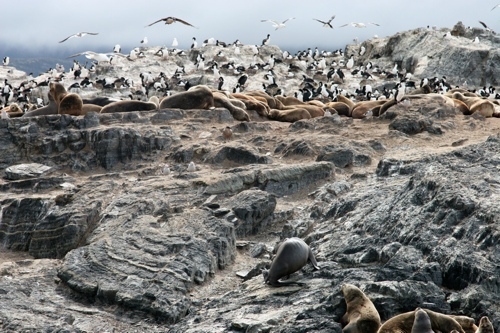 Patagonia is a stunning part of our planet anyone who loves nature should see for one's self. Photos cannot do it justice. The land is rugged yet pristine, inhospitable yet inhabited by incredibly friendly people who treat it with respect, are justly proud of it, and are happy to share it with visitors. I also can't recommend enough Gap Adventures and their wonderful tour guides and crew. They made the experience overwhelmingly positive and a real adventure. 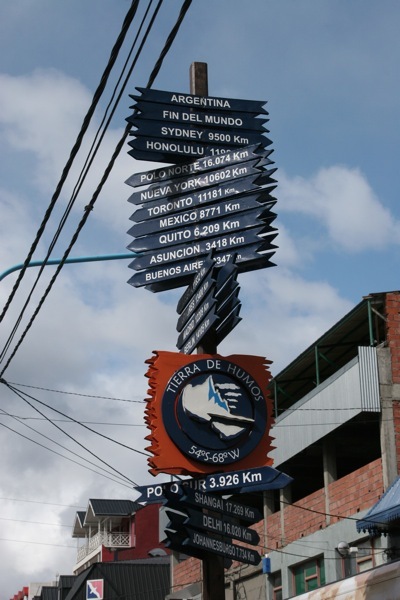 At Fin del Mundo, nothing points south. The Catholic church on St Martin, Ushuaia's main street, is a good reference point.